The 2013 Border Cups were recently hosted by Dumfries Tennis Club over the weekend of 24th & 25th. The tournament is open to Border and D&G players and this year saw a healthy turnout from both districts and the sun also made a welcome appearance. On Saturday the Men’s singles took place with 8 D&G players and 3 from the Borders. After some brilliant matches Colin Dunbar took on Kevin Breen who won the event last year. After a one-sided first set which Colin took 6-0 Kevin stepped up and presented more of a challenge but after a few tight games which went Colin’s way, Colin then saw out the match 6-3 to claim back to back titles after winning the D&G Confined earlier this year. The Sunday saw another good entry for the Gents Doubles with 7 players from the Borders travelling over and 13 D&G players making up the numbers. After a couple of qualifying matches the quarter finals got under way. Lister and Dan McKiddie (D&G) just edged out Border pair of Adrian Moir and Simon Hammond 6-3, 7-5 in the all D&G clash. Stephen White and Paul Boardman recovered from a set down to just edge a championship tie-break against Dumfries pair Graeme Cross and Martin Wilson 5-7, 6-1, 13-11. Returning duo of Fraser Patterson and Brain Lister who both played for Dalbeattie but now reside outwith D&G took on another Borders pair of Glen Gordon and Jonathan Adamson. The first set was tight with Brian and Fraser just edging it 6-3 but in the second the D&G Confined holders showed their class and took the second 6-0. The last quarter final saw current Singles champion Colin Dunbar pair up with Borders favourite and previous winner and organiser of this event Johnny Short. They faced Annan pair Michael and Malcolm McEwen who despite their best efforts were no match for the experience pair who eventually ran out 6-0, 6-1 winners. 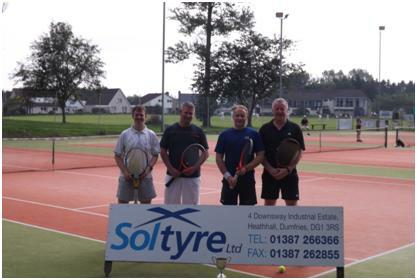 The semi final results saw Colin & Johnny win 6-2, 6-3 against Stephen & Paul and in a repeat of the D&G Confined final Brian and Fraser won a tight match 6-7, 7-6 and 10-8 in the championship tie-break against Dan & Lister. In the final Colin and Johnny edged past Brian and Fraser 6-4, 6-2. In the consolation final an all Dumfries clash saw Martin Wilson and Graeme Cross just edge past Richard Cunningham and Kyle Singh 6-2, 3-6 and 10-8 in the tie-break. The committee wish to thank Soltyre Ltd for the continued support of this event.